Offering you a complete choice of products which include soapstone powder. Talc or Soapstone or Steatite is an alteration product of original or secondary Magnesium minerals. Talc is hydrous Magnesium Silicate and its chemical composition would correspond to 63.5% Silica (Si02), 31.7% Magnesia (MgO) and 4.8% water (H20). In nature, chemically pure Talc is very rare, it has some contaminations. 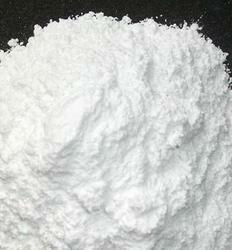 Talc has a greasy or soapy feel and Pure Talc is characterized by extreme softness. Soapstone Powder has good luster or sheen, high slip or lubricating power, good hiding power and ability to absorb specific types of oils and grease. Talc is inert to most chemical reagents, although it exhibits a marked alkaline pH of 9-9.5. It has low electrical and chemical conductivity. Talc is widely used in many industries as a filler/extender and in other industrial applications due to its natural physical and chemical properties and relatively low price. Soapstone Powder is used in industrial applications because of its lamellar platy nature, softness, whiteness, hydrophobic features, atmosphere & acid resistance, high thermal strength, chemical inertness, high dielectric strength, high melting point, and absorption features. Particle size distribution is a critical parameter in most Talc Applications. Soapstone Powder for paints, paper, plastics and cosmetics (with whiteness ranging from 80% to 98% with fineness up to 800 meshes with varying calcium percentage, ranging from 0.5 to 15%).